Old Delhi is amazing. It’s everything you would imagine India to be like. Pure sensory overload! I was totally engrossed with the hub bub of swriling activity around me I didn’t even know WHAT to take a picture of. It couldn’t really be captured on film anyway…the smells that nearly knock you over, the mass of people whisking by on all sides of you, the paranoia of getting pick pocketed, the never-ending stream of shops and vendors all trying to lure you into their nook to see their goods at a “very special price”, the spinning bicycle wheels of the rickshaws filling the streets, and the symphony of car horns ringing in your ears. It’s mind-bending and I loved every minute of it. Here is one poor attempt of the lone snap shot I took, though it doesn’t even begin to capture the true chaos it will at least give you a little taste of this bustling bazaar. 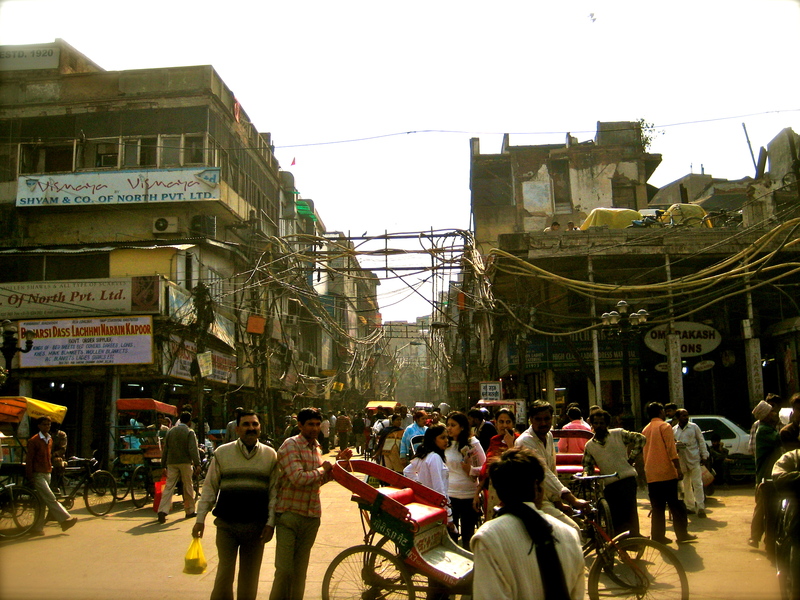 This is the main road through Old Delhi, from here, as my guidebook puts it, dozens and dozens of little crowded streets jut off like clogged arteries. It’s fascinating.